"I'm caged. I'm alone. I'm frightened." 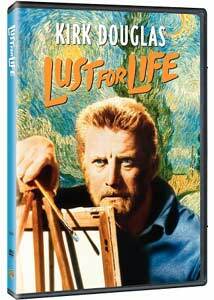 Vincent is played by Kirk Douglas, his hair and beard hennaed to match the red we know from the self portraits—Douglas has always been a powerful and a visceral actor but never a subtle one, and so his version of the artist's delicate constitution plays itself out in screams and broken dishware. Vincente Minnelli directs, and you get the sense that he almost wishes that this was a musical. The soundtrack swells at any moment of even nominal importance, and you expect the bombast to spill over, to see Kirk break out into song. Fortunately for us, he never does. We first meet Vincent when he thinks his calling is to be a clergyman; soon he understands that his true mission is not to minister to the underprivileged, but to paint them, and give their images a dignity and a respect that's long been lacking. The story follows Vincent through a series of romantic misadventures as well—first with his spurned romantic advances toward his widowed cousin Kay, and then in his problematic relationship with laundress/part-time prostitute/single mother Christine. But the true love of Vincent's life seems to be Paul Gauguin—this is the 1950s and it's not supported by the historical documents, so Minnelli doesn't go all Brokeback Mountain on us; still, there's the suggestion that only the self-promoting Gauguin can slake Vincent's loneliness, and even that Gauguin is a gigolo of sorts, or at least a professional friend. (He's paid a stipend by Vincent's brother, Theo, to stay and paint with Vincent in Arles.) The most devastating event for Vincent, as portrayed here, is Gauguin jilting him; the film plays a little fast and loose with the facts, too, suggesting that Vincent's famous act of self-mutilation, his cutting off part of his ear, was a response to Gauguin's departure. And as played by Anthony Quinn, Gauguin is in many ways the most vital force in the film�you almost get the sense that it's he and not Vincent who has the true lust for life. There's some great stuff in re-creating the images of Van Gogh's canvases, too�seeing the artist's famous bedroom, or the models for The Potato Eaters, or the quack Dr. Gachet who, as part of his psychiatric care, bullied his patient Vincent into painting his portrait. Vincent's relationship with Theo is sort of the spine of the movie; Minnelli makes a curious choice with his use of voice-over as well. Vincent's letters to Theo are beautiful meditations on what it means to be an artist; but here they're read not by their author but by their recipient, further distancing us from the notion that Kirk Douglas could be a great painter. The filmmakers seem to have enlisted the cooperation of just about every museum and collector who at the time owned a Van Gogh canvas of significance, and so we get lots of masterpiece shots; the outcome is inevitable, and we follow Vincent to his sad end, leaving behind an extraordinary body of work and the sense that even here in this movie about him, he remains deeply misunderstood. Image Transfer Review: Some of the colors have dulled with the years, which is a particular disappointment for a film like this, especially given the many discussions that Van Gogh and Gauguin have about their respective palettes. Audio Transfer Review: Reasonably clean audio transfer, though the music on the soundtrack sounds particularly overwrought in the 5.1 mix. Extras Review: Film historian and Minnelli biographer Drew Casper provides a commentary track that frequently sounds like little more than a string of superlatives. He's much better when he's discussing images of American manhood in the 1950s, and how the Van Gogh of this film comports with, say, the public face of Marlon Brando; he's also good on the threat posed to films by television, and on Minnelli's use of CinemaScope. Also, it seems like an obvious and missed opportunity for this DVD not to carry an image of any sort on the disc itself. Learning about art from a movie like this is sort of like learning about history from Oliver Stone—it's entertainment before the facts, but this is a passionately felt if resolutely Eisenhower-era take on the life of Vincent Van Gogh.